Growing up, my family and I spent every major holiday (Thanksgiving, Christmas and Easter) at my paternal grandparent's home. I should add that they lived a couple of miles away from us. Their house sat on the main farm where my dad worked so we spent a lot of our days there but holidays were special times. Grandma would do the majority of the cooking with everyone else bringing a covered dish to add to the already groaning table. When Amy over at a Latte with Ott, A revealed that Baking Powder was the secret ingredient for her April 15-22 Iron Chef Challenge, I decided to honor my grandma by using one of her recipes. Luckily, Baby Sister sat down with our grandma several years ago and recorded several of her recipes - some that were written on well-worn recipe cards and others that resided only in grandma's head. Baby Sister then put together the collection and gave each of my sisters (and I think my cousins) a copy. Every Christmas Eve, Grandma would make a crock pot or two of her Oyster Soup, which was a favorite of my dad. Every Thanksgiving, there would be a pan of dressing next to the turkey. My grandma made a great angel food cake from scratch, as well as a cookie sheet cake that my mom remembers fondly. Actually, my mom flipped through these recipes and decided to make my dad some bread pudding over the weekend using Grandma's recipe! This time of year always makes me remember one of my family's quirky traditions. For as long as I can remember, my family headed over to my grandparent's house on Holy Saturday (the day before Easter) for some of my grandma's Butterscotch Rolls - these ooey gooey pecan topped cinnamon rolls. They were delicious and after 40 days of little to no sweets because of Lent, we devoured pan after pan of them. I thought about making her Butterscotch Rolls but I thought I might keep those for a future Iron Chef Challenge (perhaps with a secret ingredient of yeast?). I settled for Grandma's Butterscotch Brownies. I have to admit that I don't remember my grandma making these but when I looked at the ingredients I could imagine that this was a recipe that she put together when she needed a dessert in a hurry. I gathered my ingredients, including Clabber Girl Baking Powder - the secret ingredient. I started by combining 2 cups of brown sugar and a half cup of shortening. Using a hand mixer (I don't have a fancy Kitchenaid), I mixed them together. Then I added 2 eggs and mixed well. Once combined, I added half the dry ingredients to the wet ingredients and mixed. I like to incorporate the dry ingredients in by hand before turning on the mixer because when I don't, flour flies everywhere. Maybe it's operator error, but it always happens to me! Always. I decided that it was lacking something...specifically it was lacking chocolate. So I added a cup of chocolate chips! Then I spread the dough into a 9x13 pan...yes I covered mine in foil because I have 10 rolls of foil in my pantry and I HATE washing baking pans. Then I baked it in a preheated 350 degree oven for 20-25 minutes. Since this was my first time baking this treat, I worried a bit about how long to leave it in so I left it in for 23 minutes...probably could have left it in for the full 25 and been just fine. Because it had shortening in it, the brownies puffed up quite impressively while in the oven and then settled once cooled. The insides were gooey, kind of like butterscotch - I think. They were quite good and my dad said that they tasted similar to what he remembered. So they were a success! Have a recipe using baking powder that you think is a winner? Go here and enter Ott, A's Iron Chef Challenge. Deadline to enter is April 22! Cream together brown sugar and shortening. Add eggs and mix well. Add vanilla and mix. Sift together flour and baking powder. Slowly add dry ingredients to wet ingredients and mix well. Spread into greased 9x13 pan. Bake 20-25 minutes. Looks fantastic. Grandma's recipes are always the best. Sounds yummy! Treat for the next girls' wkend? lol! I should stir in the flour first too. I usually cover myself with a dusting of flour when I bake! I did NOT know Clabber Girl was an Indiana company! Where have I been all these years besides right here in Indiana! Geez-O-Pete! Thanks for sharing one of your grandma's treasures! My mom makes something like this.. too bad she never thought to add chocolate chips!! I will have to share that thought with her!! I love that you have a "cookbook" from your Grandma!! 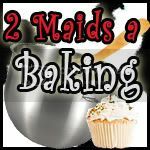 Thanks for linking up to 2 Maids a Baking!! Butterscotch is one of those things I love, but never think about until somebody mentions it. these look great. Thanks for linking up to the Iron Chef Challenge.